Victory - Honor God. Make Disciples. | We’ve got free apps for you! You are here: Home / We’ve got free apps for you! We’ve got free apps for you! Great news! 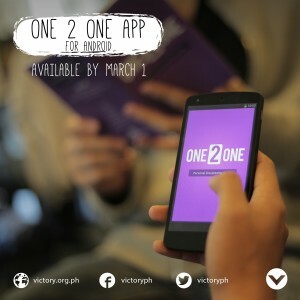 You may now download the Victory app on iOS and Android, and the official ONE 2 ONE Android on the Google Play Store. 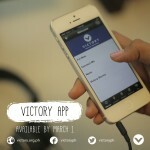 The Victory app includes free resources such as series podcasts and Victory group materials from our Metro Manila locations. It also has our national directory, so you can find the Victory location nearest you! Through the Victory app, you can also get connected to a Victory group based on your desired schedule and availability. You can also download ONE 2 ONE Android for your Android smartphone! Share the gospel anytime, anywhere with our seven-lesson booklet. Once you install these apps, don’t forget to activate push notifications so you can receive in-app updates from us! Download our free apps today, and share them with your friends, too! We hope our resources help you honor God and make disciples. Thank you, Marian! We hope our resources help you honor God and make disciples! Bakit hindi ko po maopen sa android? Hi, Ali! May we know which Android device you’re using? Thanks! working on making our apps compatible with Android tablets. Please watch out for updates! will you release an app for blackberry? Hope you can work the compatibility of Victory App for tablets sooner. Thaanks! please have a One2One APK for this… God bless! Victory app was not compatible with my tablet, i download it to my phone instead. I love this app. This what I need.